For The Ripple Effect:the Fate of Fresh Water in the Twenty-First Century, by Alex Prud’homme, Pearce notes that the book is true to its title, following the use and abuse of water from a brutal drowning at a waterworks to the link between water and energy. 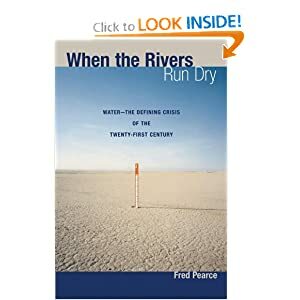 Pearce neglects to note that he is a hydroscribe himself, having authored When the Rivers Dry: Water–The Defining Crisis of the Twenty-first Century, a book that warns of a dire future for water resources and for mankind. I’ve read Pearce’s book, and can vouch that it is worth your time, but be forewarned: his view of the future is not a rosy one. Whichever you pick, any of these would be a fine addition to your summer reading list.